IT IS HERE!!! Today is the kick-off of my 30-day November to Remember, No Excuses November, Challenge 2014! Click here to review the challenge. I am so excited about how many of you I have heard from who are making a commitment to yourselves to do the scaled-down version of the Parkinson’s Recipe for Recovery® for the 30 days of November. I have heard from some in Australia and New Zealand who are half-a-day or more ahead of me on time that they have started the challenge already. Congratulations to all of you on giving yourselves the gift of working on your Parkinson’s recovery. Today, I have some added inspiration to assist you in this journey. In my previous post announcing the 30-day challenge, I encouraged those of you already doing the Recipe to share how you were doing to inspire the new people. Veterans to the Recipe and some new people taking on the challenge posted comments to that blog post. I share them with you here for inspiration to kick-off the challenge. thankyou, thankyou, thankyou for that post. I have been intermittently on the Road for some time now (with diverse excuses as to why “it wouldn’t work for me”) but this time I intend to do the full thirty days, as suggested! November to Remember here I come! Dear Howard, I’ll go for it. This is my commitment. It is going to be a November to Remember for me. Thanks for this november support. Thanks to Howard and to each one of you who so freely share yourselves with me. Howard I haven’t managed to be consistent with doing the recipe but will commit to making this a November to remember! I’m realising that that hearing other people’s progress is also hugely motivating. Thanks for sharing people. It’s great to feel like part of a community. Howard you are totally amazing and I feel blessed that I have your support. Howard you are a truly wonderful human being. You lift my heart with every message. Howard, where would we be without you and your continued encouragement. Thank you so much for being there for us. I just am so thankful for finding your website, it has been truly life changing on the Parkinsons road. I see things so differently now and am chipping away at that iceberg on a daily basis! I have just received my manual by post, and learned about the November challenge, so I’ll give it a go, still familiarizing myself with the different exercises, and hope I’m doing them correctly. It feels good to be fighting back, as since I was diagnosed in 2012, I have never given up hope of recovering. So thankful to have stumbled upon your website Howard, and look forward to reporting in with improvement. Hi Howard! I was diagnosed in January 2014. Thank God I found you! I started the exercises and program in September and have already gotten back my sense of smell! I know I am on the road to recovery and continually picture myself as healed. Blessings to you and your work; you are a godsend to us all! Are all of you inspired? I know I am! As you can see from these comments, you are not your Parkinson’s symptoms…you are something more than symptoms…you are the loving, beautiful, caring, grateful essence of who you are. The symptoms may go up and down, but you remain strong, solid, and ready to cure yourself from Parkinson’s. Some of the people who posted these comments are just a bit ahead of you on this path toward recovery, and some of them are just like you getting started right now. They are committed to curing themselves from Parkinson’s! Now it is your turn. Jump in with both feet! Accept the challenge…make the commitment to yourself…grab onto the scaled-down version of the Recipe…make this your November to Remember for your Parkinson’s recovery. “Together we have the power to heal the world.” Every time another person starts down this path to recovery, together we are growing in numbers and we do have the power to heal the world. Make the commitment to yourself for recovery! I am like a dog on a tight leash, ready for the OFF lol. Here’s my notes for my Inspiration, all taken from your posts Howard. I AM the peaceful Warrior on this November Challenge. With Love to you all and gratitude to you Coach. Lets do this together ! Here we go…… Because we are DOING the Recipe for Recovery, we are becoming healthier and happier every day! Thanks to all of you and to Howard for inspiring and helping me along this amazing road to RECOVERY ! Have a victorious, fearless month taking one step at a time…remembering your best is always good enough. Wonderful to read all these life stories. Yes we are all on the road to recovery. We wouldn’t have been led to this website if we didn’t know in some part of us we can and will recover. I have been doing the recipie now for close to 3 years I realise I am stronger physically . I am inspired, and I know there is a chance every day to enjoy what life brings. I am no longer completely being ruled by Parkinson’s. It’s here but I myself am recovering. Yes smell is back, and I am not ruled by fear but more by love Thanks Howard for being the support, you are being recovery itself. Through natural means and inner guidance It is so worthwhile to be on this recovery journey. All best wishes to the new people that have found Howard. It is so worthwhile. Enjoy. Helen G.
I have been practicing the full Recipe for four months every single day. After taking medication for three days following my diagnosis in June 2014, I knew that medications were not the right road for me. I felt horrible taking the medications. From doing the Recipe, I feel better each and every day. I am walking better. I have full use of my left arm now. I can lay on it. I am not shuffling anymore. My cramping is completely gone. I have no stiffness. My slowness has improved and is still improving. I Thank you, I Thank you I Thank you ! Be Brave and Honestly Stick to the RECIPE and you will cook yourself a fine and peaceful life ! You can do it! It is so beautiful to read all of these posts. To those of you who have accepted the 30 Day Challenge, congratulations!! You are so fortunate to have found Howard and his amazing Recipe for Recovery! 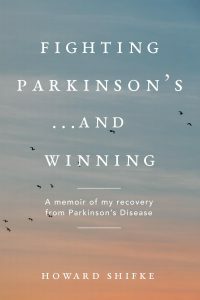 You are recovering from Parkinson’s ! Since I recovered , I don’t do the Recipe for Recovery anymore, but when I committed to following the Recipe, it totally changed my life. From the Recipe, I learned how to live a happier, less stressful life and learned the importance of savoring what is good in each day, and practicing,Gratitude. Howard once told me that for some people who find the website….and I paraphrase here, since I do not remember the exact words….a block to recovery is thinking that Howard is so amazing ….so committed, so full of Faith…that,in some way he is “better” and that is why the Recipe worked for him. Maybe you do not believe that you could do the Recipe ” as well” as Howard did it. Maybe you don’t feel 100% faith in your recovery and you think that will keep you from recovering. As he does for many of you, Howard holds a very special place in my heart, my mind and my spirit. I love and admire him. He is a truly rare and awesome being!!!!! like doing the Recipe, I did it anyway. When I did not have Faith in my recovery, I did not let that derail me; seeing how easy it would be to let lack of faith get in my way , I “acted as if” I had faith, until my faith caught up with me again. Whatever obstacles you find, you can also find your way to sidestep them. Don’t let ANYTHING stop you.